There are very few anime series that can accurately capture what life was like in the times before technology. In the times before the advent of Christianity when the people referred to as the Pagans were in power. They would normally be known as the Vikings or Northmen. My guess is this anime series’ setting would be about 1700’s Northern Europe. That’s mostly due to the scenery of castles and open fields full of cattle and farmland. There are no cars, only carriages pulled by horses. The storyline follows a middle-age peddler named Lawrence, dreaming of once owning his own shop and becoming a famous merchant. Unfortunately for him, he has not fallen on good fortune, but this hasn’t stopped him from mastering the art of doing business or the many foreign currencies of different countries. Still, to his dismay, he hasn’t found a wife yet either, but this doesn’t stop him from falling for a young shepherd girl before a faithful friend. Reluctantly, it would be impossible to find a wife until he settles down and stops traveling, but in order to do that he has to open up a shop and have a place to live so he isn’t constantly paying for the inn. Luckily for him, on a routine traveling path delivering some fine wheat to a Pagan village, he picks up a wayward traveler. A very beautiful young woman with wolf ears and a long bushy tail. She claims to be Houlo, the Pagan’s God of good harvest, and it is to her doing that the Pagan village has prospered so much when in comparison to the other villages. Unfortunately for her, she has realized that the Pagan’s no longer need her assistance in caring for their food or their wellbeing. So she feels alone. After hearing this sadness, Houlo declares she wishes to return to her homeland, in the north where everything is glistening in snow crystals and magnificent trees, and Lawrence promises to accompany her on her journey. So the two set off on a grand adventure to Houlo’s homeland. To me personally, I have never watched an anime that is so “Slice of Life”. Everything that happens in this anime, with the exception of Houlu, follows events that really would happen in colonial Europe. Still, though, I wish there was a tad more action. Very little blood or gore is shown even though there are clear deaths in the series. To its credit though it keeps your attention with real-world problems about the uncertainties of living in an environment so devoid of law enforcement like policemen. The point in time this series covers, there very little stopping marauders or bandits from threatening our main characters. The series had me going a few times when I thought death was right around the corner. The reluctance of Houlo to show her true form is understandable because she wishes to show the humans that she can still be a kind God, but eventually, she is forced to protect Lawrence so he can lead her back home. In terms of cliffhangers from episode to episode, this show has none. Which leaves very little incentive for the action of binging through it. Each episode has its own subplot leading into the next one that covers the bigger story of what life is like for Lawrence and Houlu traveling together. And that’s something that I find rather upsetting. 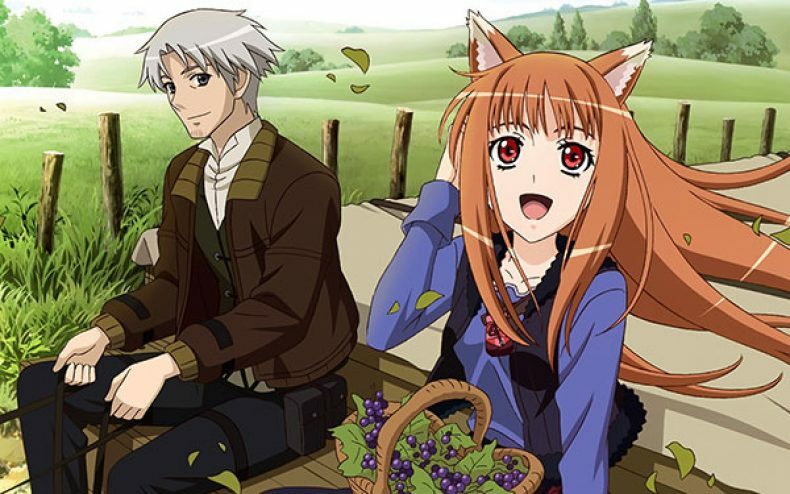 The anime focuses more on bonding the characters rather than the character’s goals. The goal is to reach Houlu’s homeland and yet the series takes its time with the subplots of money management and financial scams happening in the markets. It only makes sense though that a man like Lawrence gets involved in these greedy exchanges because money is a necessity to travel. He should be so lucky that Houlu is often there disguised as his wife to bolster his profit margins with his clients. Although being so overzealous with gain might lead to imprisonment or eternal shame. While the pacing of this first season is awful it tells a very compelling story about what it is like to live in colonial Europe and to embark on such a harsh quest to the north. Although I get the feeling that before I even see the series finale that I already know the ending. And that’s bad. I hope in hindsight that there is a twist that perhaps when Houlu does indeed payback Lawrence for all the debt she owes him something goes wrong before it goes right. It’d be a shame for this series to lack an epic climax because watching such a chill and relaxing first season with very little going awry for our main characters was upsetting for me. And I don’t exactly view chase scenes or money laundering as exciting and action-fulfilling plot points. The first season hardily ends on a cliffhanger but rather a happy note that leads into the next season. Overall I wouldn’t recommend this anime series to anyone with a lust for action or adventure. I would give it to someone with a hefty degree of patience and a passion for soap operas.